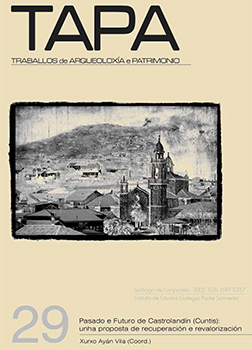 This work is a synthesis of historical and archaeological research developed by the Laboratory of Archaeology of the Padre Sarmiento Galician Studies Institute and the Terra Termarum Foundation about the Cultural Heritage of the Council of Cuntis. This volume starts with a series of studies about archaoelogical and differents issues on History of this land from the Recent Prehistory to the present projects on Heritage Reassessment and Social Dissemination of the rich Heritage of Cuntis. This book was added to our online catalog on Wednesday 08 April, 2015.